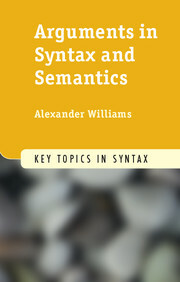 'Key Topics in Syntax' focuses on the main topics of study in syntax today. It consists of accessible yet challenging accounts of the most important issues, concepts and phenomena to consider when examining the syntactic structure of language. Some topics have been the subject of syntactic study for many years, and are re-examined in this series in light of new developments in the field; others are issues of growing importance that have not so far been given a sustained treatment. Written by leading experts and designed to bridge the gap between textbooks and primary literature, the books in this series can either be used on courses and seminars, or as one-stop, succinct guides to a particular topic for individual students and researchers. Each book includes useful suggestions for further reading, discussion questions, and a helpful glossary.